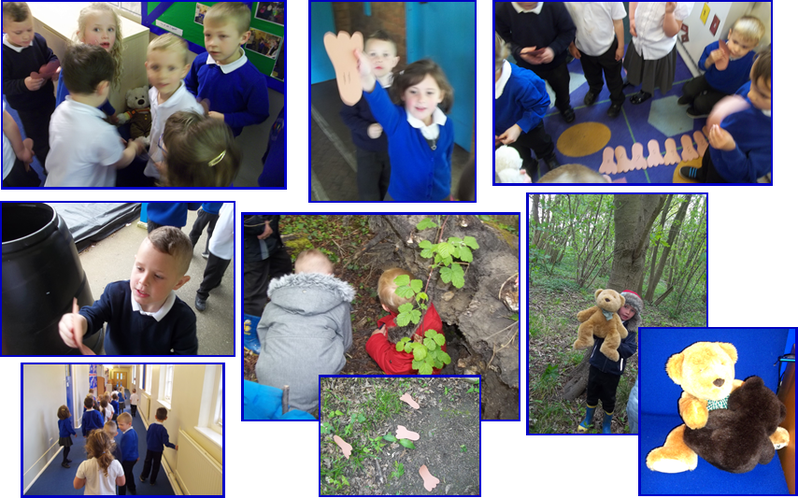 F2 - We’re Going On A Bear Hunt…! This week, we have been learning to write riddles; we played a game where we had a picture of an animal and we had to write clues about it for our teachers and friends to guess. Olivia wrote: “ I am black and white. I woof and have a tail.” Can you guess what animal she is writing about? Our gymnastics teacher, Emma, was poorly on Tuesday so we didn’t have gymnastics, but that didn’t stop us from having fun! We all went into the hall together and played team games. We had to listen carefully and follow the rules. We worked in teams to keep the right coloured balls in the hoops - we could even try to knock balls out of the other teams’ hoops! The team with the most hoops was the winner. We are very competitive! We also played parachute games where we had to find objects by their initial sounds. Learning is such fun! We’re going on a bear hunt! We are going on to catch a...cuddly one! On Wednesday, the Giraffes went on a Bear Hunt around school. We collected bear foot prints with numbers from 0-20 on them, which led us to one very cuddly bear! The Zebras went into the woods to find Daddy Bear. Little Bear came to the Zebras’ class to ask if they could help him find his daddy. The Zebras were fantastic searchers! They looked under the dens, up the trees, behind trees and under logs until they finally found Daddy Bear. We all gave him a hug, as he was very cold, and took him back to school to Baby Bear.